I’m not going to blather on much here, except to say that if you missed it, I did post a Valentiney jar I made last week here as I promised I would. I also posted photos of some of my Mom’s knitting here in honor of her birthday this weekend. But, for now, please head over and see how I solved one storage problem made some simple Ribbon Jars for my thin ribbon. that is a great idea for ribbons, which I use a lot of. Plus, having two cats who think anything that is hanging over the edge of a table is fair game for pulling and running away with. they are a brilliant way to store them. Hope you have a good week. I haven’t tried it, but I assume you can use bigger holes and put larger sized ribbon into jars of different sizes. Fab idea. And they look so pretty too! Love the valentine jar – really brilliant idea for not just Valentine’s day. 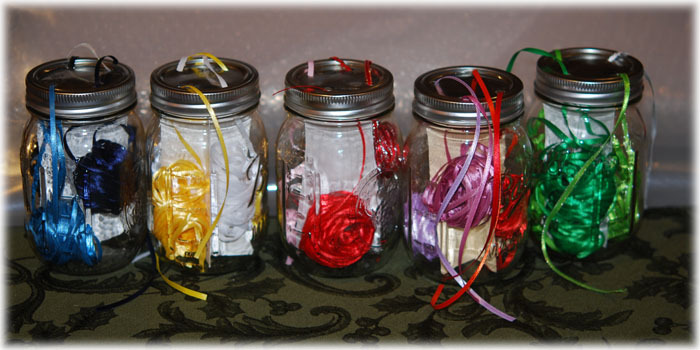 Your ribbon jars would make super gifts as well as a good storage idea.